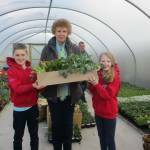 To plant a garden is to believe in tomorrow, and Silver Hill Garden Centre, Emyvale, believes that all families should be encouraged to grow their own plants. 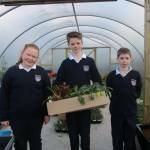 To promote this, they invite all the primary schools from the parishes of Donagh, Truagh and Tydavnet to the centre each year, and on the day they get a chance to see around the centre, view the polytunnels, and take away a selection of plants to cultivate at their school. 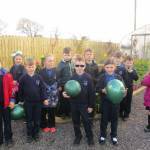 There was no shortage of “growing” minds in attendance at the centre on Monday 30th April, and there were 10 schools present – Clara, Deravoy and Knockconan; Corracrin, Billis, Edenmore and Glaslough; Tydavnet, Urbleshanny and Knockatallon. 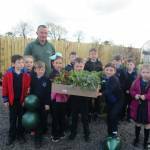 JohnJoe Sherlock from the garden centre welcomed everyone to the centre, and the children had a great morning seeing around the polytunnels, meeting students from other schools in the area, and best of all, trying out the very tasty cooked duck products. The vegetable boxes for the schools contained various varieties of lettuce, broccoli, parsley, and strawberries, we look forward to a lovely crop of produce in all the schools later in the year. School gardens have many benefits – students learn focus and patience, cooperation, perseverance, respect, pride, teamwork and social skills. 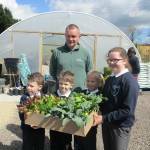 They gain self-confidence and a sense of “can do” along with new skills and knowledge in food growing. 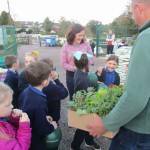 Garden-based teaching addresses different learning styles and intelligence; everyone can blossom in the garden; learning is relevant and hands-on; it’s a very healthy activity, and it promotes better food choices. 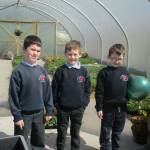 Growing plants and flowers also links well to the curriculum – geography, science, (seed germination, plant parts, water cycle, temperature weather etc); Maths (weight, time, capacity, volume, numbers, fractions); Culture (native foods, natural resources, agriculture, food justice); Language, (poetry, creative writing); and a chance to learn in the great outdoors. 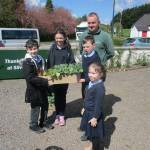 We wish all the schools “Happy Gardening”.